Bought and reconstituted by Stonegate, the pubco. I was impressed by this pub. Maybe I was a bit lucky with my timing, it was at about 6pm on a Saturday with the Rugby World Cup on TV. The pub was not crowded at all. It seems to be smaller than many JDW pubs. All 12 (?) handpumps were on, with none of the irritating "beer settling in the cellar" signs that you usually get in a JDW pub. What's more the beers were all interesting ones from the Beer Festival or other guests - I don't think there was a single one of the usual Ruddles etc. Service was quick and pleasant. Probably the best Weatherspoons I have been in. a nice pub a lot less busy then it used to be but that's because they have got rid of all the FOOLS the next step would be nice if you had a smoking area that was not on the high street. A Spoons is a Spoons is a Spoons - and this is a Spoons. It's an old converted cinema which accounts for its long oblong shape. It looks like most Spoons - the same furniture, the same menu, the same general ambience. We were a little disappointed in that when we visited quite a number of the range of beers were unavailable. We settled for Otter which was fine. It was Thursday so I plumped for a curry. It was fine for what it was - if I'd wanted the full works I'd have gone to the tandoori down the road. The place was quite busy and had a nicer atmosphere than the ones in say Woking or Slough. Not as good as Staines or St. Neots though, which are more like real pubs. I don't knock Wetherspoons - when I was young we'd have killed for a pub selling this much real ale. I judge them in their own right, and looking at some of the reviews for other pubs in Walton, I was quite happy with our choice. 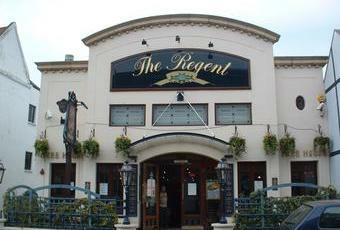 Large long pub just off the High St.
Normal Spoon's fare but the cliental when I visited was of a high standard. 3 ales on draught as well as the normal Ruddles, Smiths etc. Television was on but no sound as is the norm.